Drywall has been used in home construction for many years. It is easier to install than plaster walls and is less expensive. However, because it is installed in sheets, it is susceptible to buckling. The main reason that drywall buckles is that it gets wet, and as it dries it has a tendency to warp. Repairing buckled drywall is somewhat involved, but if it's done correctly, no one will be able to tell it was repaired. Cut out the buckled area of the drywall, using a utility knife. Cut the drywall on both sides far enough to expose the studs. Measure the cut-out area, using a tape measure. Use a utility knife to cut out a piece of drywall from a new sheet according to the measurements you determined in Step 2. Cut the drywall from the paper side by scoring it first, and then make several passes with the knife to cut completely through the drywall. Place the drywall in the cut-out area of the wall and make sure it fits correctly. Secure it to the studs, using 3/4-inch drywall screws and an electric drill with a driver bit installed. Space the screws every 18 inches, and make sure they are driven in so the heads are flush with the surface of the drywall. Cover the drywall seams with self-adhesive drywall tape. Smooth joint compound evenly over the tape and any screw heads that are not covered by the tape. Use the knife at a low angle to the surface when spreading the joint compound and at more of an angle to remove excess joint compound. The goal is to make the seams as smooth as possible with the joint compound. When it is painted, the seam should not be visible at all. Allow the joint compound to dry for 24 hours. Sand the seams and any other place you applied joint compound, using a drywall sanding screen. Lightly move the sanding screen over the joint compound to remove any ridges or high areas and generally smooth the surface. 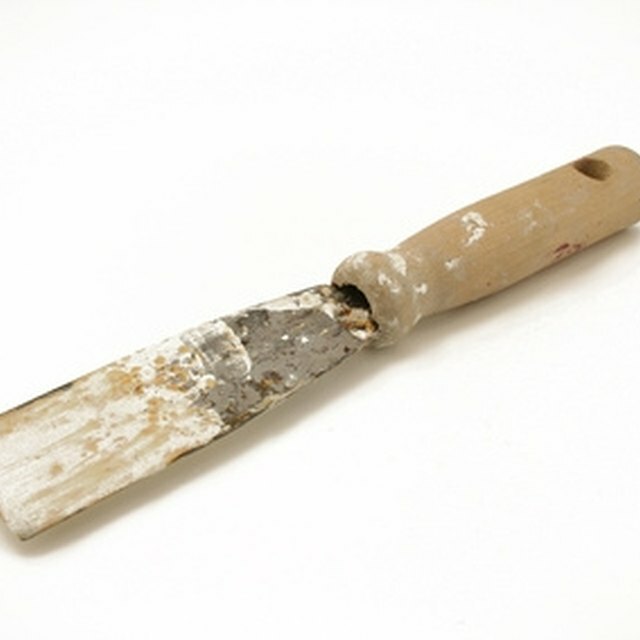 Apply another coat of joint compound, using an 8- or 10-inch drywall knife, and sand it after it dries. Paint the repaired area with paint that matches the rest of the wall, using a paint roller and applicator.